Here is my final Mode costmetics polish. This one is called Jaded. Like the others, it applied smoothly and thinly. 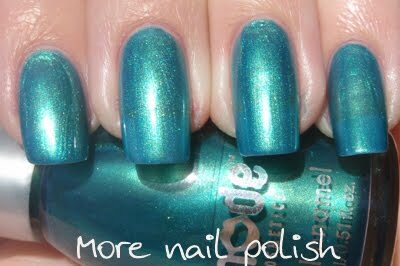 This is a beautiful teal shimmer. I can still see tiny brush strokes, but they certainly don't take away from this lovely colour. This looks very similar to Revlon Aqua Blast. I will have to do a comparison swatch to see. I'm planning to do a whole week of holo posts cause I just got my Nfu Oh holographics in the mail, as well as some more of the OPI Designer Series holographic polishes.